Joetsu Science Museum opened in 1984 with the theme of "human science" and "the science of snow". 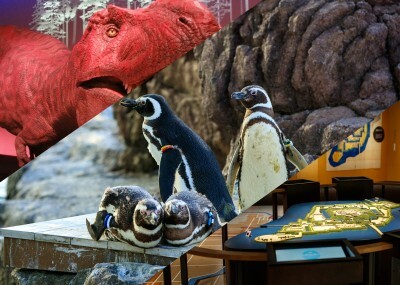 The permanent exhibition area consists of "Evolution of Humanity", "Wonder of Life", "Body Mechanisms", "Living in Health", "Living, Environment, Energy", "the Science of Snow", "Evolution and Environment of Life" "Children’s Park", and "Science Play Park". These are divided into nine zones, and each theme is exhibited in an easy-to-understand manner. In addition, we hold various events such as a nature observation classroom, science show, science festival for youths, inventive ingenuity / model / work exhibitions, specimen exhibitions, etc., in order to further increase and broaden interest in science. This museum was planned as part of Takada City’s 60th anniversary commemoration project, but since Takada merged with Naoetsu City during construction, plans for the building changed and it opened as the Joetsu Municipal General Museum in April of 1972.Since opening, we have collected and displayed mainly valuable ski items since the birth of skiing in Joetsu. These focus mainly on archaeological data of the Joetsu district and folk materials related to snow. However, in 1992 a separate museum entitled the "Nihon Ski Birth Memorial Hall" was opened. All the items related to skiing were transferred here at this time. In addition, from July 2000, we expanded and refurbished construction to increase storage cabinets and exhibition rooms that were narrowed and renovated on September 29, 2001. In the renovated general museum, we have set up a space where pedestrians of Takada Park can rest, and a lounge where visitors can relax. In addition, we set up a book corner where you can browse books from the General Museum, and we have further enhanced the service functions for visitors.Currently, in addition to history and folklore materials of the Joetsu district, we collect artwork related to the region and hold exhibitions of borrowed items from other museums four or five times a year. We also hold special exhibitions on the themes of history and art and we hold various lectures, gallery talks, parent / child courses, etc. aimed at making the museum more familiar to citizens. Also, since April 2004, we have shared facilities with the "Kokei Kobayashi Memorial Museum of Art".